The autogenerated boot folder (stored in /home/YourUser/piboot) is made up of a number of configuration files and boot files. System.map-KERNEL – A debug file for kernel panics. Bootcode.bin – Untouched Raspberry pi bootloader. Cmdline.txt – Default kernel config file, contains NBD server IP address, by default this is 1.1.1.1. CmdlineLocalSD – The cmdline.txt file with the kernel settings for a standard Raspbian OS. CmdlineNBD.txt – The cmdline.txt file with the kernel settings for Raspi-LTSP NBD booting. CmdlineNFS.txt – The cmdline.txt file with the kernel settings for Raspi-LTSP NFS booting (legacy). Config-LTSP – The main Raspberry Pi config.txt file for Raspi-LTSP. ConfigLocal.txt – The main Raspberry Pi config.txt for local Raspbian booting. Config.txt – The current in use config.txt file, by default boots Raspi-LTSP. Config_standard – The main raspberry Pi config.txt for Raspi-LTSP with overclocking disabled. Initrd.img-KERNEL – The initrd used by Raspi-LTSP. An initrd is a mini Linux operating system used to kickstart the main operating system. It contains the bootmenu script. Initrd.img-KERNEL-NoMenu – The old initrd used by Raspi-LTSP. It does not contain the bootmenu script. Kernel_emergency.img – An untouched Raspbian recovery kernel. 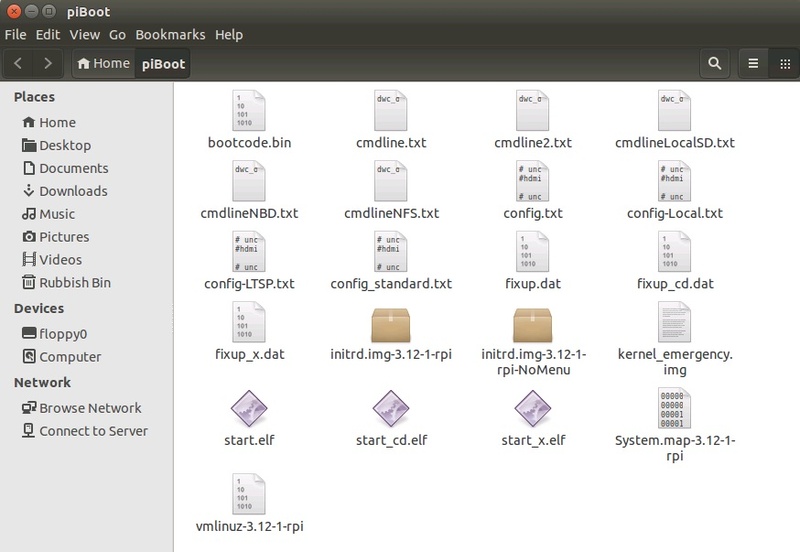 Start.elf, start_cd.elf, start_x.elf – Untouched Raspbian boot files. Vmlinuz-KERNEL – The main Raspi-LTSP kernel. Kernel.img – An untouched Raspbian kernel.